As a film student at CU Boulder, I’m making an effort to review some of the films being shown here at the International Film Series (IFS), the University’s historic art-house series programmed since 1941. For more information about the films, showtimes, and locations, visit www.internationalfilmseries.com. Chances are that if you’ve ever watched an action or thriller film in your life, you’ve seen a variation of “Point Blank.” It combines many of the most often used action tropes, from the “everyman-fights-to-save-his-wife” premise to the “massive-police-corruption” plot twist right down to the generic thriller title (“A bout portant” in the original French). Yet “Point Blank” seems completely unaware that this has all been done before, attacking the material with a ferocious energy that breathes new life into these worn-out action standards. The story follows Samuel Pierret (Gilles Lellouche), a nurse who saves a hospital patient after a shadowy figure tries to sabotage the patient’s recovery. 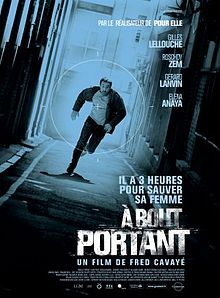 The patient, however, turns out to be Hugo Sartet (Roschdy Zem), a thief wanted in the investigation of a high-profile assassination. Hugo’s associate kidnaps Samuel’s pregnant wife (Elena Anaya), demanding that Samuel break Hugo out of the hospital. It won’t be easy, as two rival police teams – one led by the mysterious Commander Werner (Gerard Lanvin) – have discovered Hugo’s identity and refuse to let him out of their sight. As Samuel attempts to save his wife, he uncovers much more than just a simple assassination plot, and soon finds himself pursued across all of Paris by cops and criminals alike. The best action films are the ones that take time early on to establish the characters and what they have to lose, and “Point Blank” is no exception. One of the film’s best narrative decisions is that Samuel’s wife Nadia isn’t just eight months pregnant, but has also been ordered by her Doctor to stay on her back until she gives birth; any strenuous activity could threaten both the baby’s life and Nadia’s. In a wonderful use of foreshadowing, two of the film’s first scenes depict the relationship between Samuel and Nadia, demonstrating the depth of their love while Samuel’s pampering serves as a continual reminder that Nadia must stay off her feet. This adds an incredible sense of weight to Samuel’s struggle: since we’ve seen how much he loves his wife, his emotional pain is entirely palpable, and Nadia’s pregnancy complications provide the film’s key source of tension. Every second Samuel is away from her is a second she’s either running, standing, or in a state of emotional turmoil, all of which threaten her already fragile pregnancy. As Samuel, Gilles Lellouche sells it all with a powerfully honest performance. He doesn’t have too many modes to play other than ‘worried’ or ‘panicked,’ but Lellouche finds a surprisingly expressive range within these confines, creating the kind of endearing everyman we can instantly relate to and root for. I might also note that I was highly tempted to label Lellouche as “French Liam Neeson,” just in case readers wanted a mental image of the character (though Neeson is usually more reserved). Elena Anaya is very good as Nadia, wringing an awful lot of mileage out of what is essentially a damsel-in-distress role, and she and Lellouche have tremendous chemistry in their few scenes together. The other two key performances are Roschdy Zem as Sartet and Gerard Lanvin as Werner, both of whom maintain a delightfully wicked look and persona throughout the movie. Lanvin radiates evil with every glance and Zem’s badassery is never in question; there’s very little meat to these two characters, but as broad action types, they are skillfully drawn, and their wordless confrontation in the final scene sends the film out on a rousing high note. Fred Cavaye’s direction is excellent, staging a number of complex and wildly intense action sequences. Like the Jason Bourne movies, the action is realistic, down-to-earth, achieved primarily through glorious practical effects, and will either leave the viewer breathless or on the edge of their seat. It’s particularly impressive to watch how much tension Cavaye can pull out of one expertly edited set piece, especially once we reach the third act; the climax goes for broke while never loosing its handle on reality, and it’s a joy to watch. At a brisk 84 minutes, “Point Blank” is exactly as long as it needs to be, perfectly paced without any unnecessary pit stops or unclear plotting. Yet it also feels a bit slight; Cavaye always keeps the focus on the plot and the action, making no attempts to inject any substance into the proceedings. That holds “Point Blank” back from being a truly great movie, but it’s a valid creative choice; Cavaye knows exactly what he wants out of the film and he executes that particular vision flawlessly. I’ve seen other thrillers crumble under the weight of excessive ambition; as a pure action piece, “Point Blank” is an impressive effort, definitely worth a watch for genre fans.